Entertainer's Secret will stop putting best by dates on the bottles because people were confusing that with expiration dates. If not stored in extreme hot or cold areas ES should be good for three or four years. Age may affect taste but not effectiveness of the product. Relief for.....Throat Discomfort, Hoarse Voice & Congestion Caused by Excessive Dryness. Just when you thought Entertainer's Secret Throat Relief could not get any better... it has! KLI Corp. is thrilled to introduce Entertainer's Secret Throat Relief with an extended nozzle. 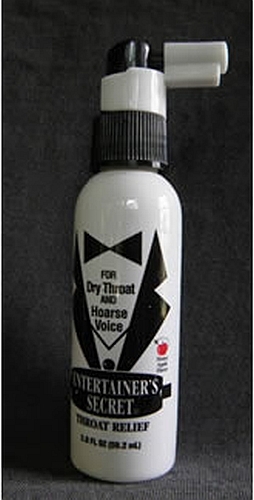 This directed spray allows for a more efficient and precise delivery to the back of the throat and vocal apparatus. > Even better in providing rapid relief of hoarse voice, dry throat, vocal strain, etc. when due to dryness. We invite you to join the thousands of satisfied users who have been sharing our "Secret"! Entertainer's Secret has always been, and is still fat-free, sugar-free, gluten-free... and offers the same great taste.